GATE 2019 Atmospheric & Ocean Science Syllabus has been Released. GATE 2019 is a national level exam organized by IIT Madras. The Engineering Graduation Skill Test (GATE) is organized for admission to PG courses in the field of engineering and technology, specifically ME / M.Tech. The exam will be held on 2nd, 3rd, 9th February and 10th February 2019. See here for complete information about the GATE 2019 Program. GATE 2019 Atmospheric & Ocean Science Syllabus has been Released. Click Here to Download Pdf. Fundamental of Meteorology, Thermal structure of the atmosphere and its composition, Radiation Balance and Laws, Wind Belts, Monsoon, Climate. Atmospheric Thermodynamics. Hydrostatic equilibrium and: Hydrostatic equation, a variation of pressure with height, geopotential, Tropical Convection. Atmospheric Electricity. Cloud Physics. Observation Techniques of the Atmospheric Properties. Fundamental Equations. Pressure, gravity, centripetal and Coriolis forces, the continuity equation in Cartesian and isobaric coordinates, Scale analysis, inertial flow, geostrophic and gradient winds, thermal wind, vorticity. Atmospheric turbulence, baroclinic instability. Atmospheric Waves. Tropical meteorology: Trade wind inversion, ITCZ; monsoon trough tropical cyclones, their structure, and development theory; monsoon depressions; Climate variability and forcings; Madden-Julian oscillation(MJO), ENSO, QBO (quasi-biennial oscillation) and sunspot cycles. Primitive equations of Numerical Weather Prediction. General Circulation and Climate Modelling. Synoptic weather forecasting, prediction of weather elements such as rain, maximum and minimum temperature and fog. Data Assimilation. Seawater Properties, T-S diagrams, Ocean Observations, Ocean Tide and Waves and their properties. Coastal processes and Estuary Dynamics. coastal zone management. Wind-Driven Circulation: Ekman, Sverdrup, Stommel and Munk theories, Inertial currents; geostrophic motion; barotropic and baroclinic conditions; Oceanic eddies. Global conveyor belt circulation. Subtropical gyres; Western boundary currents; equatorial current systems; Current System in the Indian Ocean. Momentum equation, mass conservation, vorticity. Ocean and Wave Modeling, Ocean State Forecasting. Data Assimilation. Ocean Turbulence. Chemical Property of seawater, major and minor elements, their behavior and chemical exchanges across interfaces and residence times in seawater, Element chemistry in atypical conditions-estuaries, Biochemical cycling of nutrients, trace metals and organic matter. Air-sea exchange of important biogenic dissolved gases; carbon dioxide-carbonate system; alkalinity and control of pH; biological pump. Marine Pollution. 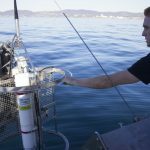 Primary and secondary production; factors controlling phytoplankton and zooplankton abundance and diversity; nekton and fisheries oceanography. If you any query regarding GATE 2019 Atmospheric & Ocean Science Syllabus, you can ask your query leave comments below.